This homeowner is maintaining this bathroom's classic, traditional feel with an acrylic claw-foot tub. Note the side-mounted fixture--a feature to help save space and let the bather stretch out all the way. Why go with the typical wimpy, translucent "bathroom window" when you can install a full-size double-hung or casement window to further push the "classic" envelope? Not only that, but installing a real window allows for fresh air (cutting down on your reliance for noisy bathroom fans) and gives you a convenient ledge for magazines or votives! A skylight in the shower? Why not? Unless you're worried about jets at 32,000 feet seeing you in your birthday suit, a skylight over the shower or bath is a great way to bring in natural light--and to naturally mitigate any mold and mildew growth. This bathroom incorporates a framed-glass shower at the end of the room, allowing light from two directions. The cantilevered bathroom cabinet gives the impression that it is "floating" several inches off the ground, and the white marble bathroom counter further maximizes light. If you've got the room, why not designate a separate area just for the bathtub? 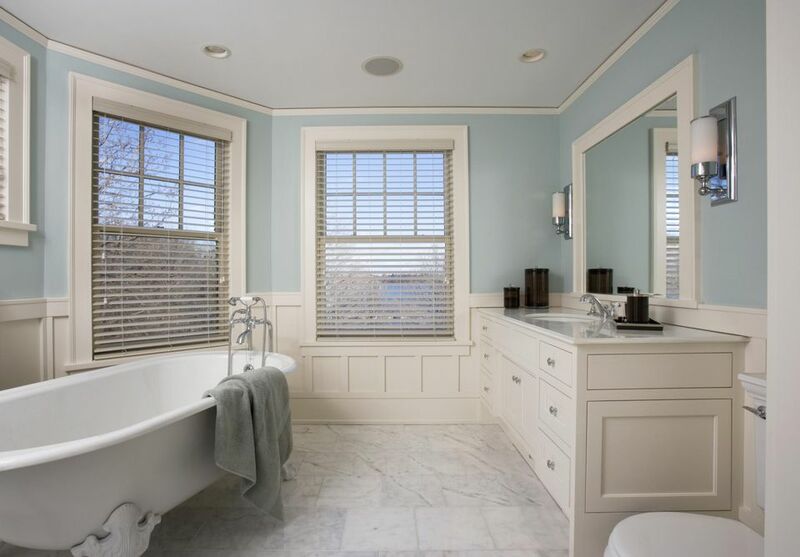 This bathroom decorating idea brings architect-quality casement windows nearly to tub height, so that the bather can read magazines or books...or merely enjoy the view. You're looking at an acrylic pedestal tub with a side-mounted fixture. Eschewing the clawfoot tub's claws, pedestal tubs come in two sections for easier delivery and installation. Pedestal tubs look more modern than clawfoot tubs, but they actually go back farther--up to 3,000 years back to the days of ancient Crete. Don't let the presence of a low ceiling stop you from bringing this great bathroom decorating idea into your house. Where the ceiling reaches below standing-height, this homeowner has placed the bathtub (who needs to stand in a bathtub anyway?). "His and her" pedestal sinks are split up by several feet. A natural-finish pine floor gives this bathroom the clean, healthy feeling of a spa or sauna. Make sure that you install flooring-grade knotty pine, and not the tongue-and-groove pine boards found at home improvement stores and used for walls. Even with floor-grade pine, you still need to carefully sand and seal the floor to avoid splintering. Imagine a bathroom decorated in the bluish-green colors of the Mediterranean Sea. It's a rather ordinary bathroom--the bathtub is nothing special--yet it is dolled up with gorgeous 6" x 6" Kibak tiles, given extra emphasis with black edging and banding. This picture shows the true power of tile, and how the mere addition of the right kind of tile can completely change a room. I will not attempt to explain one unusual element of this pictured bathroom. I refuse. Okay, you tortured me long enough, I will: the shower outside of an actual shower stall? Alas, this belies the fact that this bathroom--pretty though it is--is a demonstration bathroom set up to display the tile (Ann Sacks) and fixtures (Kohler). Lest you think that this is one of those wall-less, stall-less showers, note the absence of a drain and the presence of the wood baseboard. The tile is from a series called Earthenware Elements. Sconces are Montparnasse. Severe or modern? Sterile or contemporary? Depends on your worldview, I suppose. This is a supermodern, super cube-like bathroom idea with not a single curved line to be found anywhere*. The single-sink Hanalei bathroom vanity and vessel sink are squared-off and linear, as are the tub fixtures, wastebasket, mirror, sconce lights, and even the towel racks, for crying out loud. * = One secret bit of curvature is found in the tile. Not obvious from this view, upon closer examination you'd see that the Ann Sacks Clodagh Shield tile is indeed curvy. A bit. I have been vocal in previous articles about my dislike for vessel sinks. I think they are impractical and gimmicky. Dare I say this? Will I eat my previous words? No, but: something about the shape of this Spools vessel sink fills me with bliss. Color, too. This is one vessel sink I won't mind cleaning that impossible-to-reach acute angle where the bottom of the sink and the lavatory counter meet. The tile from Ann Sacks, as they say, is "hypnotic." Agreed. The sconce is Lexicon Bone China. I'm not even sure you can call this an "idea" so much as it is an attempt to replicate the look of an early 20th century bathroom, but with modern materials. For one, the cream-colored subway tile wrapping around the room, wainscot-style. For another, the classic pedestal sink with polished nickel fixtures. The upper tile is called Circa, in Celeste Crackle. This is a great look that works well for small bathrooms. Bathroom Decorating Ideas: Bring 1920s and Great Gatsby Into Your Home? Do you like the 1920s-1930s? Like it enough to decorate your bathroom in that style? This 4" x 6" field tile (Bluehour) is one way to give your room that certain look. Finish it off with a Kallista Circe bathtub and a Michael S. Smith toilet. Put Some...Celery on Your Bathroom Walls? Why not? Sometimes, I don't know what to call a style, especially when the predominant wall color is something like this 4" x 8" diamond tile in what Ann Sacks calls "Celery Gloss." It's an apt description, I suppose, of this greenish-yellowish tile. The black and white toilet and the dark cabinet and mirror punctuate the wall color, further defining it. Sure, we like the mirror (Tuxedo). Sure, we love those sconces on either side of the mirror. That console is fantastic (Counterpoint). What we really love is the tile. Imagine bathroom wall tile that no one else has. You're looking at a Barbara Barry line of tile from Ann Sacks, an elongated hexagonal with alternating matte and glossy finishes. Color: Ivoire. A bathroom with only the most basic of elements: tub, vanity, mirror, sconce. Those elements chiefly being square or rectangular. Square: the 4" x 4" Barbara Barry tile on the upper part of the wall. Same designer for the 3" x 6" subway tiles on the lower half. Black espresso Mortparnasse mirror tops this sleek and sophisticated bathroom vanity. Wavy tile (Ann Sacks/Angela Adams) finishes off this fun and lively bathroom. Feeling tired? Get refreshed in your new bathroom in 2" x 6" glossy tile. The walnut console is called Orlo and the sink is Biancone. These tiles: round, matte, and with ridges in them. I like the look, but all I can think is: what about the cleaning? Andy Blick, by Ann Sacks. This bathroom is modernity at its best: a long monolith of a light suspended over a shallow black onyx sink. The room positively glows from the Inca sandbrushed 2" x 2" brass tile on the wall. It's a vaguely Asian look for a modern bathroom. A bathroom bursting with eccentric character... Where should we start? How about the hypnotic, swirly flooring in the makeup area, with its mirrored metal tiles? Or how about the light pink curtains casting a glow on the claw foot tub. But really it's a highly antiqued brass structure supporting the sink and 3" x 6" ceramic tile (Ann Sacks) on the wall. Wall tile and tempered glass on the frameless shower work in concert for this truly unique, sophisticated bathroom design. Toilet is Michael S. Smith; tile is Ann Sacks Clodagh Puzzle.